This Sunday will see the San Francisco 49ers pitted against the Baltimore Ravens, so whether you’re a football fan or not, you may want to come out and support our neighbors. San Francisco’s close enough to adopt for cheerleading, right? We’ve scoped out some places around Berkeley you can camp out, cheer for a team you care at least marginally about and — most importantly — scarf down food for hours. Pappy’s Grill and Sports Bar. 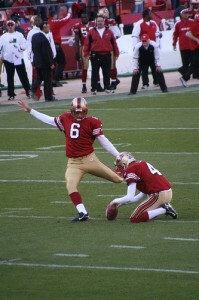 Right here on Telegraph Avenue, it’s an obvious choice for sports viewing. Lots of space, large screens and good ‘ol American/bar food will make for a good football Sunday. Kip’s Restaurant. 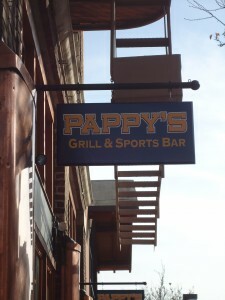 Head down Durant for another college bar if you didn’t like Pappy’s. Order pizza, burgers and more while you watch. Brennan’s Bar. For an old-fashioned sports bar complete with darts and hot plates, there’s Brennan’s on University Avenue. Old style with new flatscreens, what could be better? Bec’s Bar and Bistro. Offering more than just burgers and wings, this restaurant also has seafood and flatbreads to snack on. La Val’s. Not a place one would immediately think of, but once again there are TV screens and awesome game food like pizza and sandwiches.